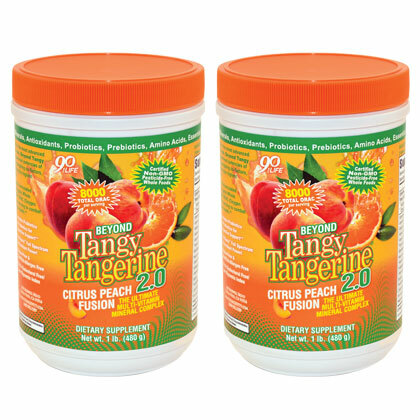 With more than 8,000 ORAC, certified organic ingredients and synergists cofactors to maximize absorption of vitamins and minerals; Beyond Tangy Tangerine 2.0 – Peach Citrus Fusion is the most advanced multivitamin mineral complex market. This complex multi-vitamin / mineral containing our famous “Majestic Earth Plant Derived Minerals ” is the most advanced multi-vitamin until today! It contains powerful, nutrient co-factors synergists, and a prebiotic and probiotic mixture promotes intestinal absorption maximum. 480 g (30 servings). * Nutrients that increase energy! * The antioxidant support PuriGenic ! * PrePro blend of prebiotic and probiotics! * More than 500 mg of natural amino acids! WARNING: If you are pregnant, nursing or taking medication, consult your health professional before using this product. KEEP OUT OF THE REACH OF CHILDREN. For use exclusive dietary supplement. 2 cans 480g. Vitamin A, Vitamin C, Vitamin D-3, Vitamin E, Vitamin K, Thiamin, Riboflavin, Niacin, Vitamin B-6, Folate, Vitamin B12, Biotin, Pantothenic Acid, Calcium, Iron, Magnesium, Zinc, Selenium, Copper, Chromium, Potassium, Organic Trace Minerals, Glucosamine, MSM, Chondroitin Sulfate, Organic Amino Acid Complex, Inositol, PuriGenic ™ Multifaceted Free Radical Defense System (Proprietary Blend: Organic bioflavonoids Amla, selenium (as selenomethionine), grape seed extract), Beet Root Extract, PrePro ™ Prebiotic and Probiotic, Co-enzyme Q10, Boron, RejuvaSweet ™ Linear and Branched naturally Sweet Chained Cellular Energy Concentrates, natural flavor and color, organic stevia, Acacia Gum.